Mark Edmonds discusses a point with Colin and Jane Renfrew and Nick Card. Today, we were absolutely delighted to be visited by Lord Colin Renfrew, one of the most honoured and celebrated archaeologists of our time and the patron of the Orkney Archaeology Society. Together with his wife, Jane, Lord Renfrew was shown round the site by director Nick, with various awed young archaeologists peeking furtively from the trenches. Although he has been associated with archaeology in Orkney for many years, this was the first time that Lord Renfrew had been able to visit the site and it was clear from the outset that he wanted to see absolutely everything. Sponges and buckets to the fore as we mop up after this morning’s rain. We were also happy to learn that the Ness will be included in the latest edition of his famous textbook Archaeology: Theories, Methods and Practice and that a photograph of Structure Twelve will be on the front cover. Later in the afternoon, we were inundated by visitors to the site. 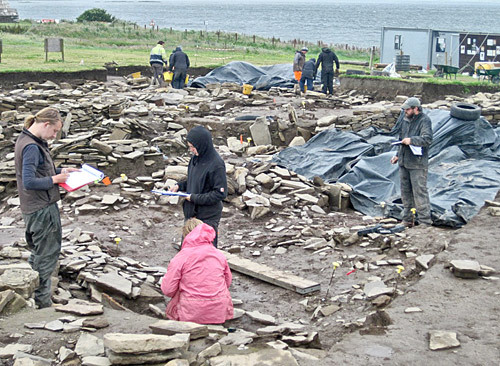 There were over 90 on the afternoon tours, while Caz, of Orkney Archaeology Tours, had a group, and Dr Val Turner, Shetland regional archaeologist, escorted a party from the Archaeological Institute of America for a tour by director Nick. 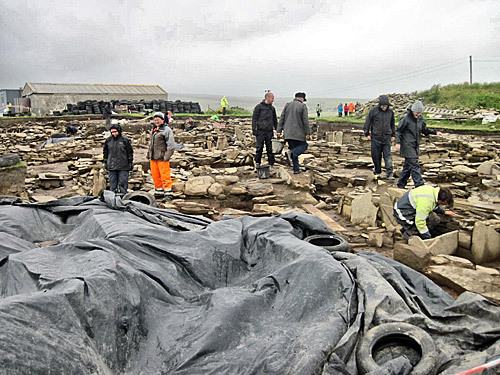 It is immensely gratifying to see so many people pouring on to the site and it reminds us one more of the huge beneficial effect the Ness, and Orkney archaeology in general, are having on the economy of the county. Crowds gather for a bumper afternoon tour. Now for some really serious archaeology. We told you last week about the fascinating story of Trench T, on the far side of Lochview, from the main trench. We mentioned the multiple pits, some of them backfilled with midden and one containing many stone flakes from what appeared to be the working of stone. Just a metre to the north-east of that pit Dave, digging this afternoon in what was the main part of the now very deep trench, uncovered a large, heavily used stone and, just in front of it, a perfectly flat stone with a neat right-angled corner. Scattered around both stones were many stone dressing flakes. Clipboards were the order of the day as the Central Midden Area team compared notes. Dave was the supervisor of Structure Eight a few years ago when the multitude of roof tiles was discovered lying on the floor. He thought instantly that this new stone looked remarkably like a roof tile and, on assessing its thickness, some 15-20mm, realised that the new stone was also in the correct range for a roof tile. Is this a roof tile? If it is, there is unlikely to be a roof nearby so, taken together with the dressing flakes all around, it seems that Trench T may have just given up one of its secrets. It seems possible that we have discovered the working site for the manufacture of roof tiles. 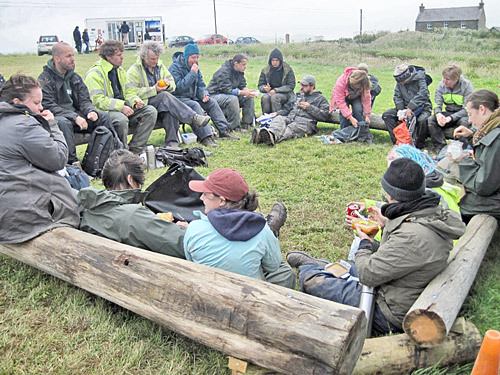 The “Diggers’ Rest” being fully utilised. The Ness was obviously a very busy place with all sorts of crafts probably taking place, such as making pots, stone and flint tools and a whole range of other artefacts. But this is the first time that a probable manufacturing site has been located. More work needs to be done and Ben and Dave seem quietly confident, rather than punching the air, but, as ever with the cautious profession of archaeology, more proof will be needed. Watch this space for further details. The weather, yes the weather again. It was foul in the morning and work was postponed for a couple of hours due to the state of the trenches, but the afternoon is pleasant if windy. Let’s hope it stays that way.